Being on the water makes all the difference! 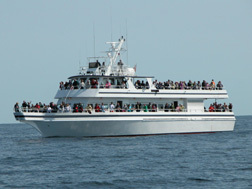 Whale Watching Cruises leave from Scituate, MA and explore the waters off Cape Cod , Provincetown and Stellwagen Bank for Humpback Whales, Northern Right Whales, Fin Whales, Minke Whales, Pilot Whales and even dolphins and harbor seals. 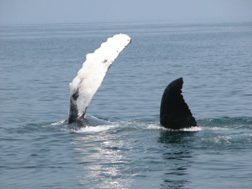 ...when you can have a boat to yourself with the whales at eye level? 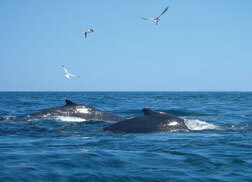 Get close to the whales... get down on the water! 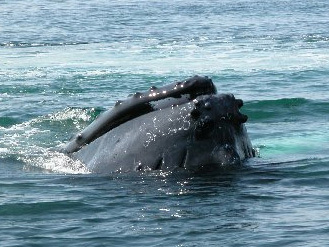 White Cap Charters strictly observes the Marine Mammal Protection Act which has set guidelines for viewing whales, seals, dolphins, and other marine mammals to prevent endangering and harassing. Chief among these is that all boats must maintain a 100 yard viewing distance. 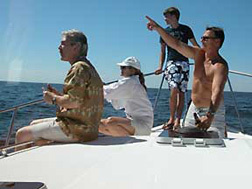 The White Cap allows you the closest possible view of the whales by getting you on the water in a small vessel and without having to jockey for the best viewing position on a crowded boat. 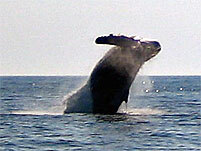 60' Humpback Whale breaching in Stellwagen Bank between Boston Harbor and Cape Cod.